Ms. Bleahene’s Rang a 6 were lucky to visit the new Microsoft campus in Leopardstown this week. As part of the visit they had to predict what the world would be like in 2050. You can read their submissions and an account of the visit here. 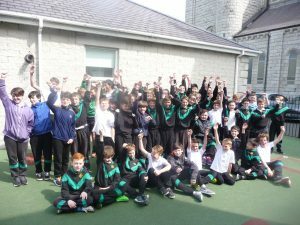 Over 200 boys from St Joseph’s took part in the Irish Board of Speech and Drama Exams this week in both communication skills and public speaking. 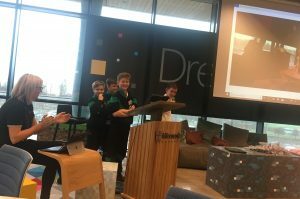 Ms. Moloney worked with the boys on vocal projection and expression through their poetry performances and presentation skills through their speeches. They all made her very proud with the examiner Ms. June Nelson commenting on the high standard they all brought to the exam room. Special congratulations go to Ryan Whybrow (Ms. Harte), Sean McKiernan (Ms. Larmer), Vihan Neththsinghe (Ms. Maher) and Peter Daly (Ms. Gorman) who were our medal winners. Well done to all the boys. Dave Rudden is a well-known author for his book trilogy Knights of the Borrowed Dark. He writes in a style like no other. His characteristics match his personality perfectly. On the outside, he is a nice, jolly man with the most majestic beard ever. He memorises chapters of his books and reads them so well that it makes you feel like you are in the book, as if you’re an invisible spectator, watching the whole story happen. He came in with a big, jolly grin on his face, ready to surprise the many boys of St. Josephs B.N.S Terenure fifth and sixth classes. We were wondering if he would bore us to death or surprise us with many jokes and laughs? He had come off a hard backstory as he was bullied when he was younger but he got over it and did acting in college. He learned that he could express himself to the world around him. His imagination is as wild and brilliant as a forest. He thought us about writing and that ideas come from everywhere. He published his books in many countries such as Sweden, France, and USA etc. He was able to pronounce all the names in all of the languages (wink wink 🙂 ). He thought in Egypt and told us funny jokes such as when he said ‘right’ his class turned right. His class in Egypt must have been very lucky to have him as a teacher. I would not mind having him next year. What nearly blew us off our seats was that he told us that he was not the best at everything but that he was brilliant at English and that his teachers would give him extra work when he was done such as reading a book. The second book of the trilogy (The Forever Court) is going to be released on April 3rd in Eason, on O’Connell Street. Not only is his book being released soon, he will also be in his own movie Knights of The Borrowed Dark. We will be the first in line for tickets for the movie. He also told us stories and here is one of them: Paul (one of his friends) was on a trip in Disney Land. He was on a Star Wars ride with his parents. When they reached the end, the Dark Lord himself (Darth Vader) greeted them. Being the most evil human being on the planet, he thought wrong if he was holding out his arms for a hug. Paul took full caution, screaming to his parents “Ruuun!” Before head butting the Dark Lord in the stomach. Not many people can say that they were banned from Disney Land because they head butted Darth Vader, but Paul can. Dave told us countless jokes and made us laugh so hard that we were falling on the ground laughing. 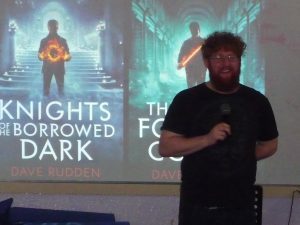 Many authors have come to our school but none of them was able to compete with Dave! Well done to our four teams who competed in the Rathfarnham Credit Union quiz in Knocklyon under the guidance of Mr. Ring. They really enjoyed themselves and clocked up good scores in a difficult quiz but the competition was very intense. 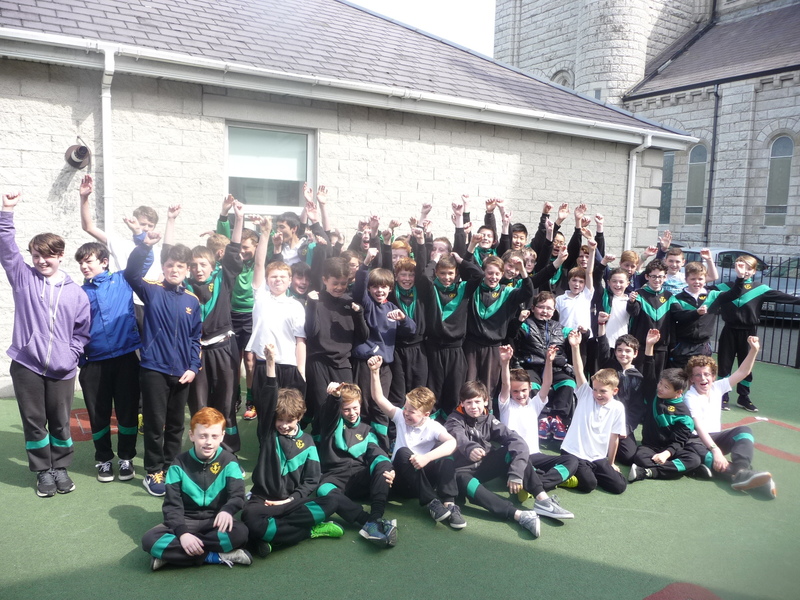 Congratulations to quiz winners Knocklyon and St. Pius. Congratulations to Finn and Dillon on being awarded gold medals for their fantastic work during maths week in October. The medals were awarded by Mangahigh. 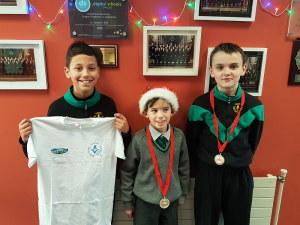 Adrian attained the highest score in the school on Duolingo (Irish) and he was awarded a special t-shirt for his achievement.